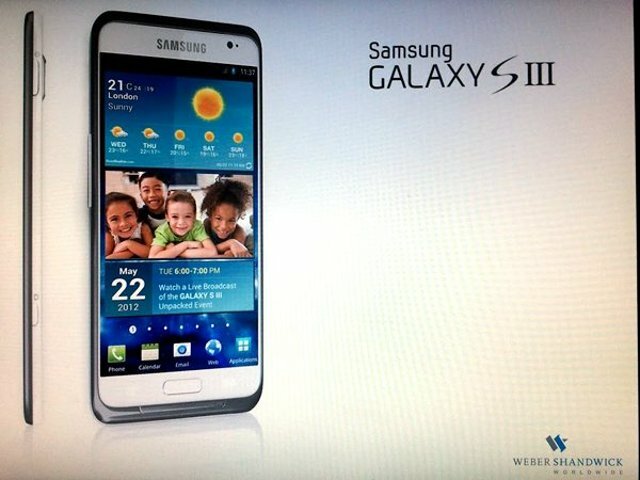 [RUMOUR] Samsung Galaxy S III @ SGS3 Launching This May 2012? Leaked photo Samsung Galaxy S III. After the success of Samsung Galaxy S II or SGS2, everyone is looking forward to what Samsung will do with Samsung Galaxy S III or SGS3. Millions of Samsung Galaxy S II units sold worldwide and 1000% more units sold compared to its previous model, Samsung Galaxy S or SGS in Malaysia, it’s considered to be on par with iPhone or some claim even better than iPhone. Earlier, everyone was expecting to see the launch of SGS3 in April 2012 in conjunction with Olympics 2012 based on Cheil Worldwide’s leaks. Then, Samsung folks officially announced through their Twitter account that SGS3 will not be launched in April 2012. This lead to everyone to point to May 2012 as the launch date of SGS3. Samsung might held its own event to launch the SGS3. SGS3 is rumoured to be running 1.5GHz quad-core processor, most likely Exynos 5 chipset. Its display will be 4.8-inch 720p Super AMOLED HD Display. It has edge to edge display with 1,280 X 720 pixel resolution and 305ppi pixel density. It will also feature a 1.3MP front camera, 12MP rear camera and 2GB RAM. It will be 8mm thick. And rumours has it that Samsung ill finally ditch plastic and use ceramic for its flagship model. It will come with Android 4.0 Ice Cream Sandwich out of box. SGS3 also might have LTE technology and also NFC-equipped. One of the more interesting rumour is that SGS3 will have wireless charging also. Wow. This is really getting out of hand. Just take these rumours will a pinch of salt. I am really quite impressed with the rumoured specs of SGS3. 8mm thick, 2GB RAM, 1.5GHz quad-core and 12MP rear camera. Damn, these are really tempting. Moreover, with its launch earlier than iPhone 5, Samsung will have a few months earlier than Apple to capture the premium high-end smartphone market. So, you will buy Samsung Galaxy S III or Apple iPhone 5? Yes. Me too. Actually I am considering Galaxy Note also. Previous story Which New iPad (iPad 3) models to buy? 16GB, 32GB or 64GB? WiFi only or with 3G/4G?